I’ve been missing-in-action for the longest time – more than 3 months to be exact. If anyone asks why, I can’t help but to point the finger at myself. Nevertheless, I am back! Oh yeah, Sawadeekrap! Thailand is definitely one of the top countries visited by Malaysians. To many, it’s known as a food and shopping haven, whereas some visit Thailand for its cultural sights. 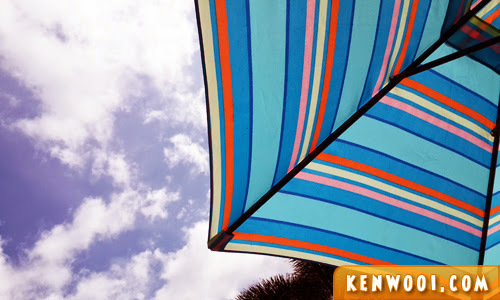 Meanwhile, some travel to the southern beaches and islands. I’m one of them. Hence, my visit to Krabi and Phuket – two locations famous for water tourism. 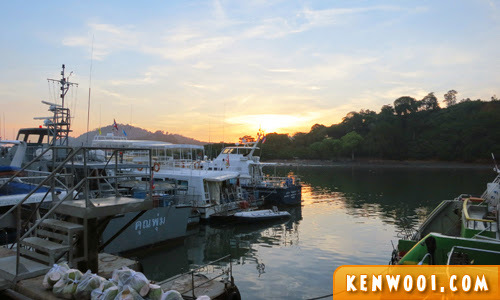 The trip started with a flight directly to Phuket International Airport, and once we landed we immediately departed to Rassada Pier to catch a ferry ride from Phuket to Krabi. 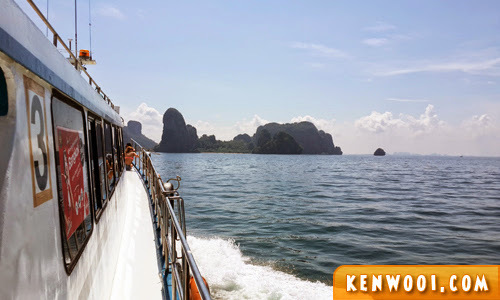 There are 2 modes of transportation to travel to Krabi from Phuket, which are via bus or by ferry. I picked the ferry because I’d prefer the sea waves than the usual roads. The ferry tickets were booked beforehand online via phuketferry.com. It costs THB1545 (RM158.80) round trip for an adult. I would actually recommend purchasing on the spot because it’ll be slightly (only slightly) cheaper since they have service tax charged online. 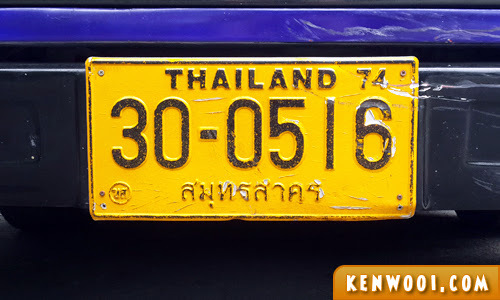 The journey took about 2 hours to cross the Andaman Sea to Nopparat Thara Pier, the port to Ao Nang. 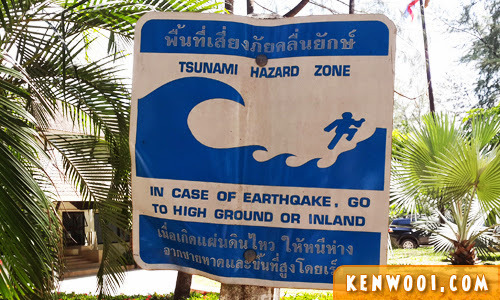 Ever since the 2004 tsunami incident, beaches are known as Tsunami Hazard Zones and there are warning signs located at every beaches. So if it happens again, just… RUNNNN!!! Run to the hills and mountains! Throughout the whole trip, we signed up for 3 separate excursions. The first one was at Krabi. 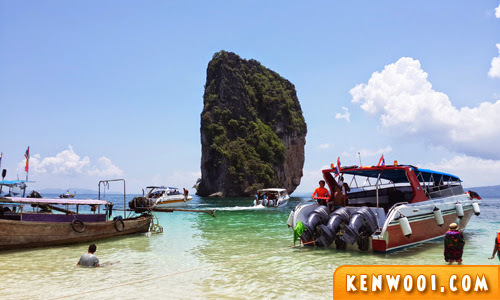 It’s called the Krabi 4 Islands Tour which brings us to Tup Island, Chicken Island, Poda Island, and Phra Nang Cave at Railay Beach. 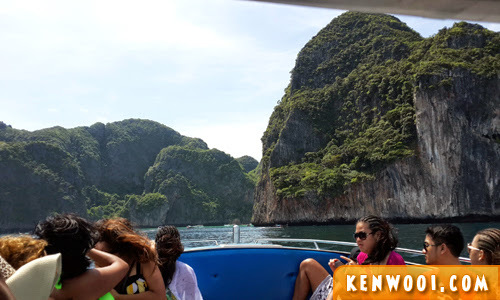 The second excursion was the Phi Phi Islands Tour where we were taken to Phi Phi Leh Island, Phi Phi Don Island, and Khai Nok Island. Phi Phi Islands are always the talk of the town. It’s like a “MUST GO” place if one travels to Phuket or Krabi. But I beg to differ. As exciting as it sounds, I felt that it was a let down because most of the locations are only meant for “sightseeing” purpose. 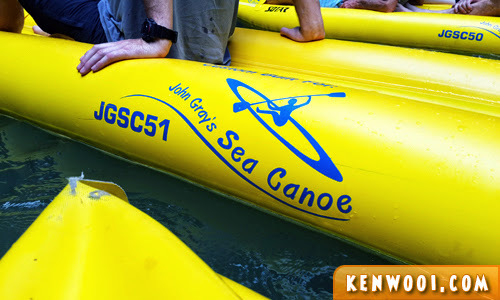 The third excursion, and definitely the most expensive one, is “Hong by Starlight” by John Gray’s Sea Canoe. The trip brings us to caves and lagoons secluded within islands which are only accessible via canoes. Although there’s nothing much “exciting” to see, it’s an experience of a lifetime! Other than that, we experienced a taste of the night market at Krabi town. There’s abundance of Thai food with very affordable prices, all ranging from THB20 (RM2.05) to THB60 (RM6.17). In fact, street foods are more affordable compared to the food served in restaurants. Besides that, getting a massage is a must when you’re in Thailand. 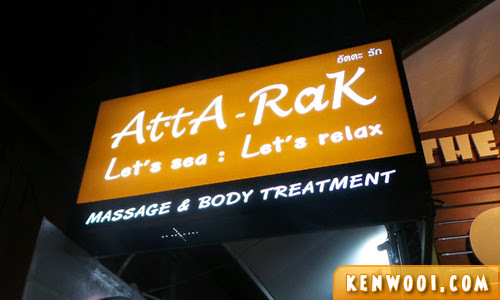 We had 2 sessions, one is a Traditional Thai Massage complimentary by our hotel at Ao Nang, and the other one is by Attarak: Let’s Sea, Let’s Relax at Ao Nang. It’s one of the most recommended place to get a massage in Ao Nang, and I’m glad it was a great experience. The place is conducive, reasonably priced, and much more professional than other massage parlours. Anyway, the stay at Ao Nang in Krabi has been a relatively peaceful one. 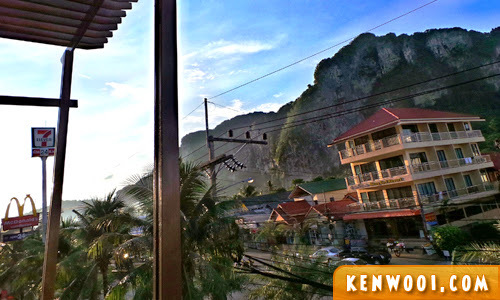 We spent 2 nights at Aonang Cliff Beach Resort and it’s located right at the heart of Ao Nang. The people and the tourists are friendly and it has a simple yet vibrant environment. Meanwhile at Phuket, we stayed at Patong, the center of Phuket’s nightlife and shopping. 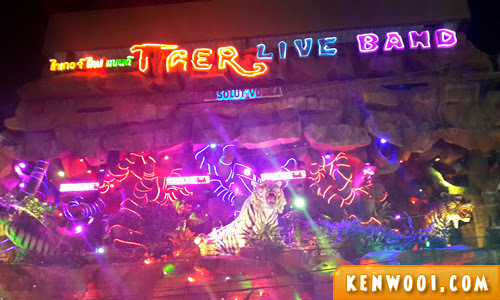 Patong is quite over-commercialized with it being the main attraction for many foreigners to have fun… and “fun”. 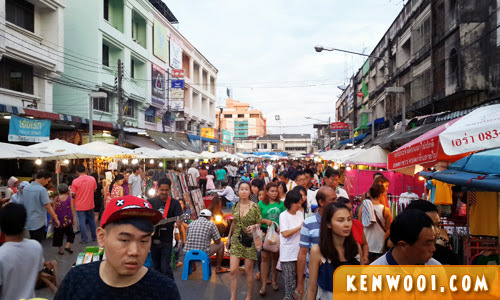 The main road, Thawewong Road, is crowded with souvenir outlets and restaurants, while Bangla Road is the road to a happening nightlife. Fortunately, the hotel we stayed in Patong, Seven Seas Hotel, is a fair distance from the spot. Anyway, it has been a fun week at both Krabi and Phuket. These two places are flocked by many foreigners, especially from China and Western countries. I’ve also learned a couple of travel tips in Thailand during the trip. CAN GET SKIN CANCER WAN YOU KNOW??!! Well, you know what… YOLO! That’s what people who doesn’t give a damn says, right? By the way, if you’re wondering where’s the “food” and “shopping” highlights of the trip, you won’t see them being featured. Thai food is just okay (what else besides Tom Yam? ), and I don’t shop. In fact, I didn’t even buy any souvenirs for myself. Ouch!!! That must be so painful. Apply lots of cold cream. Never been to these places – sure looks like a whole lot of fun…and I do love Thai food, well beyond just tom yam!!! Yum! Yum! god~~ i’m in ur picture!! !